In my mind I’m on the Carolina…. Ok it misses something without the music. The S.S. Carolina was the final dive of our NAUI Trimix II class. I have been working toward this for the last two years, and am finally done. Don’t try this at home, but here is the report. The Carolina was one of six vessels sunk by the U-151 on June 2, 1918 – a date now known as Black Sunday. The wreck is 75 miles of the coast of even with Cape May sitting in 250ft of water. Since we were leaving from Barnegat Light, the trip was probably about 100 miles. The dive vessel Independence II met us behind the Barnegat Coast Guard station at 6:00am. We spent the next 5 hours cruising out to the wreck. Several people were all ready asleep aboard, and rack space is always at a premium. Dan, the captain, sleeps next to the captain’s chair when one of the mates is driving the boat. Corey, my instructor, brought his dog, Picasso, along to keep watch on the boat. Picasso curled up between Corey and Dan in the cabin. I brought a mat along to sleep on. When we got to the site, the seas were calm with some high clouds. Clouds are not an issue on this wreck since very little sunlight penetrates to that depths. The crew threw the line in, and while we waited for the mate’s to tie in, a pod of dolphins entertained us on the surface. We thought they might be playing in the divers bubbles. Once tied in, we realized that the surface current was ripping. Equipment lines were hanging like flags behind the boat. My tanks were buried in the back of the group, so I had to wait for the others to enter the water. Many were waiting to see if the current might die down. It did let up a bit, but not significantly. Two by two the divers started to gear up and jump in. About this time a large lift bag hit the surface. Corey jumped in with fins and a rope. Once he had secured the bag, we pulled him back in. Tied to the bag was a perfect port hole. The glass was intact, and all of the pieces were there. One of the mates found it at the end of his dive. 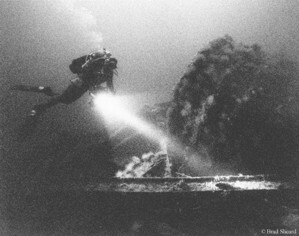 Since he was on a rebreather, he was able to extend his dive to recover it. We lifted it on to the boat and secured it. Dan wanted to wait for the mates to get on board before he jumped in. Corey and I decided to join him and dive last. This gave me time to configure my gear and double check all of my equipment. Gearing up requires a lot of redundancy. By the time you hit the water, your carrying quite a load. I figured once that I weigh over 400lb. Stumbling around on a wet deck in fins. Doesn’t that sound safe? When we hit the water, we were holding the back of the granny line. The current would take you immediately, and with all that gear, you don’t stand a chance swimming against it. Once under water, we quickly dropped down to the line. Then we started pulling ourselves hand over hand to the anchor line. The current stopped around 50 feet down. What first gets you diving this deep is how long it takes to get to the bottom. Now that the current was gone, we swam down loosely holding the line. Your free hand moves back and forth between your nose and your drysuit inflator. The decent itself takes about five minutes. After two minutes, you start to think you should be seeing the bottom. When you don’t you look at your depth gauge, and notice that your only half way there. Once on the bottom, I adjusted my buoyancy and tied off my one reel. We headed out over the debris, looking for artifacts. Here and there we saw complete port holes secured to the wreck. Since this was a training dive, I did not bring any tools to work on them. We swept over the wreck looking closely at each piece trying to discern valuable items from the silt, sand and shells. We did manage to bring up some small trinkets for our efforts, but nothing significant. There were huge ling cod swimming about in small schools of 10 and 20. There were several large monk fish laying about the wreck. It was odd to see them on top of wreckage. There camouflage works well in the sand, but they stand out on the straight edges of steel wreckage. At one point Dan came across a large lobster caught in some monofilament. He freed him long enough to get him into my bag. I estimate that he was in the 5 lb range. One advantage of the dark depths, is that many of the creatures do not know that it is daytime. Lobsters could be seen walking about the wreckage. The fish did not hide. You could almost reach out and touch some of the fish. After 20 minutes, I signaled to Corey that it was time to turn around. I started to reel my line back in and head for the anchor. We reached the line and I untied my reel right at the 30 minute mark. That was our plan, and it worked out perfectly. Now was the fun part two hours of slow decompression. When we hit the 170 foot mark, we felt the temperature drop. The bottom had been about 50 degrees. At 170 where our deco stops started the temp was now 44. These stops were short, but each one was cold. Just when we were getting really uncomfortable, I felt the temperature rise a few degrees. When we hit the 50 ft point the water was back into the 70s, but the current was back. The stops were longer now, and we deployed our john lines. Now we were hanging on like flags in the breeze. I kept looking around to see if the dolphin were still in the area, but did not see them. With nothing better to do we started looking in each others bags to see what priceless article we found. Neither of us was making history on this dive. Dan had gone up a few minutes before us, so he was out of the water quicker. We went up and started breaking down our gear. One of the mates jumped in to untie the line, and we were off back to Barnegat. Just a couple of fish. 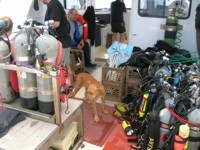 Today was a great day of diving aboard the Dina Dee II. 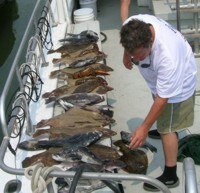 Tally for the day was 6 passengers, 31 Fluke, 8 Lobster, and an assortment of seabass and tog. We left Barnegat Light at 7:00 for an inshore dive. Captain Roger was out of commission for the day, so I was asked to help out. We hit the wreck about 8:30, and I dropped in to tie in. Once this task was complete, I began a quick trip around to aquatint myself with the wreck, a low lying wooden structure with many ribs and relief in the 6 foot range. Immediately my reel jammed, so I discarded it, and followed one rib at a time for navigation. Seabass and tog were out in great numbers, and every time I swam a few feet a fluke would jump out from under me. Every time I shot one, two more would swim away. The wreck was littered with them. By the time I came up there were eight in my bag, ranging from 17 to 27 inches. Captain George dropped in after I surfaced. I figured I had clean off the wreck, he would come up with less fish. WRONG! He came up with another bag of fluke and a few lobsters. Being a shallow wreck, I now had enough surface interval to jump in for round 2. George had thrown down the gauntlet, and we were obligated to respond. By the end of the day George and I called it a draw. We had equal numbers of fluke, but he also had lobster, while I had seabass and tog. The rest of the group had varying degrees of success, but everyone went home with lots of fish. It took us 2 hours for us to fillet all the fish. No one was permitted to leave the boat without fish or lobster. We sat and talked and had a great time while cleaning the fish.